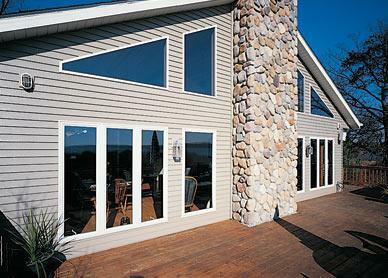 Vinyl windows are a popular choice for window replacement because of their low price and excellent energy efficiency. EcoBest Exteriors offers a wide selection of energy-efficient vinyl replacement windows by the best brands, plus professional installation. All of the vinyl windows we install are custom-made to fit your window openings perfectly. Call us at 1-844-311-5833 or click below to schedule a free in-home consultation and window replacement cost estimate in Hillsboro, Gresham, Beaverton, or nearby Oregon and Washington. Maintenance free: Vinyl house windows never have to be painted, scraped or stained and can be easily cleaned. Made from polyvinyl chloride (PVC), vinyl windows are durable and won't rust or corrode. Affordable: Vinyl is the least expensive window material. The cost of vinyl replacement windows is much less than other types of house windows, yet they will last longer, save more on energy bills and require less maintenance. At EcoBest Exteriors, we understand the challenge of choosing the best vinyl replacement windows for your home. During your free in-home consultation, we take the time to provide you with personalized recommendations and answer any questions you may have along the way. Call or email us to schedule your free window replacement cost estimate today in Hillsboro, Gresham, Beaverton, Vancouver, Portland, Salem, Lake Oswego, Springfield, Corvallis, Albany, or nearby Oregon and Washington! EcoBest Exteriors is an independent contractor and is not an affiliate of Owens Corning Roofing and Asphalt, LLC or its affiliated companies. THE PINK PANTHER™ & © 1964-2015 Metro-Goldwyn-Mayer Studios Inc. All Rights Reserved.